Phew! Where did the time go? I had planned on posting this just a day or two after the original Roses on the River, but that didn't happen. I'm so in awe by those of you who post daily, and work. I don't know how you do it. A slightly different focus from the photo in my last post. In this shot you can see the old mills a little better. For the most part they've been turned into condos, but there is still a couple business' located inside one of them. Since it was early in the morning, plenty of birds were hanging about. Herons are always a favorite of mine. Now these guys, I don't know where they came from. I do believe they're domestic Geese so where they go in the winter I have no idea but they weren't to afraid of people. For the most part they just stood there and looked at me while I kept shooting. 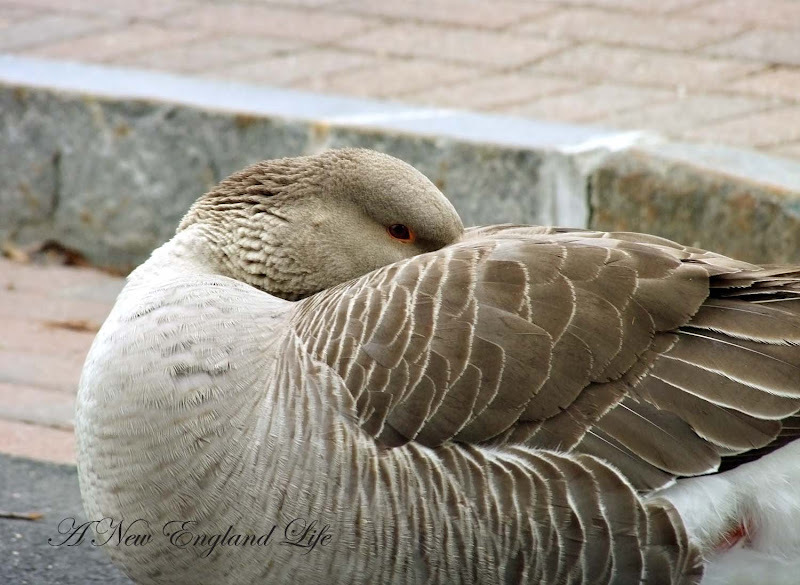 Within a minute or two it was back to standing on one leg, tucking their heads under their wings, and taking a nap. Life on the river in the morning seems pretty relaxing. What are your plans for Memorial Day? My younger daughter and I will be heading out to New Castle to hang out with friends. 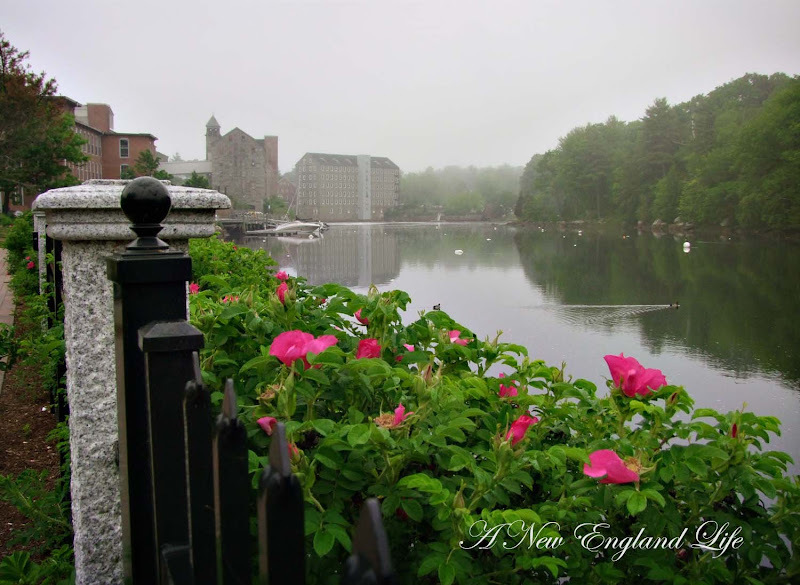 It's supposed to be a great day here in New Hampshire and we're going to enjoy it! 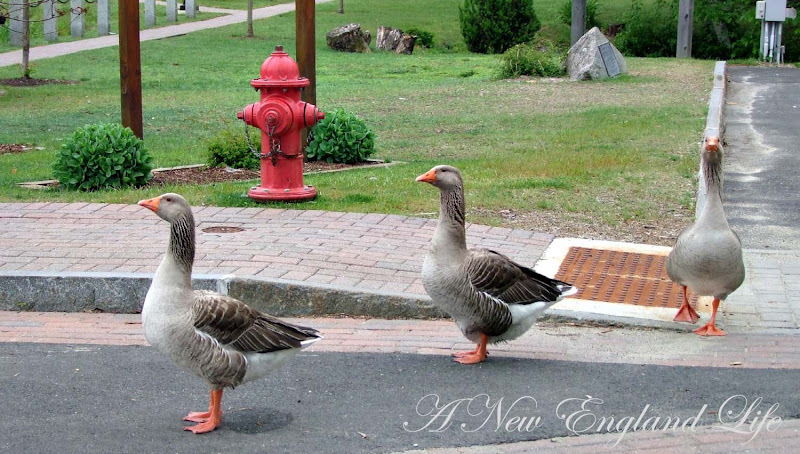 Love those geese standing so straight and tall and marching down the street like they own the place! Your photos always knock me out. SO wonderful. Those geese are adorable! I love the bright orange of their beaks and feet! Have a fun day! Oh Sharon!!! Those are breathtaking, really! The ones with the fog and the herons???? My oh my!! I may have to purchase one from you and blow it up and frame it...they are AWESOME!!!! Just stunning! wonderful photos, the misty ones are quite lovely. These are really nice. The herons in the fog are so beautiful, and the geese are adorable. I am in awe of your beautiful photos, Sharon. These geese are spectacular. 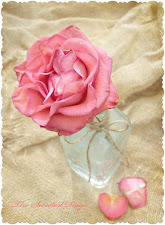 Love the pictures... so pretty! Beautiful photos, beautiful composition. The first four could be paintings. Thank you for taking them and sharing them. Have a wonderful time out at New Castle. It's one of my favorite places in the world. Yeah, where does the time go? I have no idea. I am trying to post every other day but it's not easy. 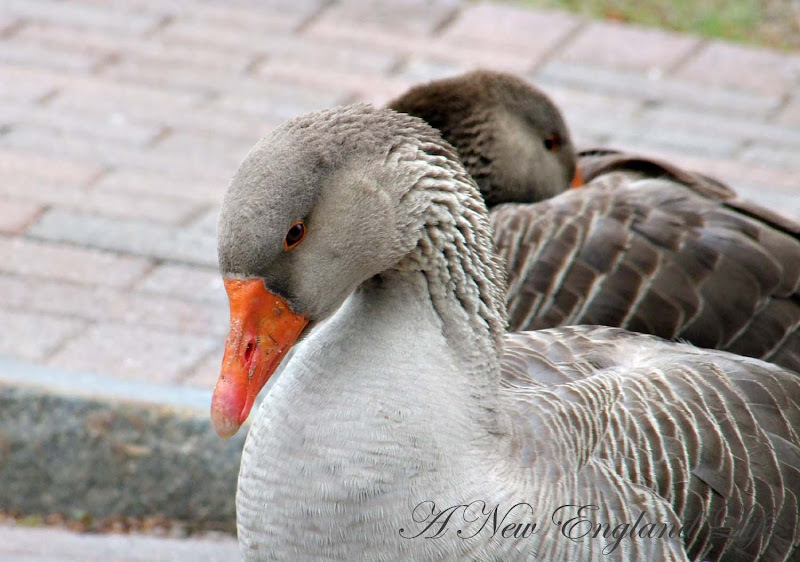 Love your photos of the geese. And the roses. Have a great time with your daughter. I went flea marketing in Rowley today. The weather was perfect! Wonderful shots, the geese walking is great! 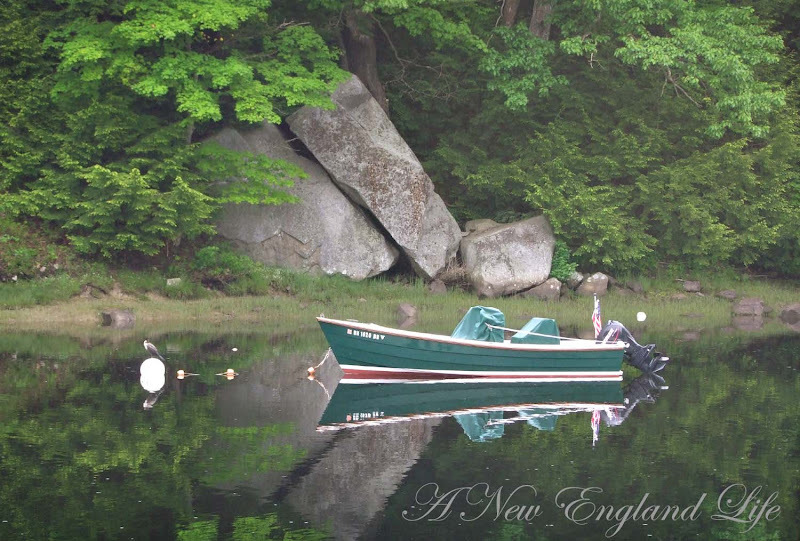 Especially love the second shot on the water with heron! Beautiful captures! The geese almost look like those statues you can by for your yard! 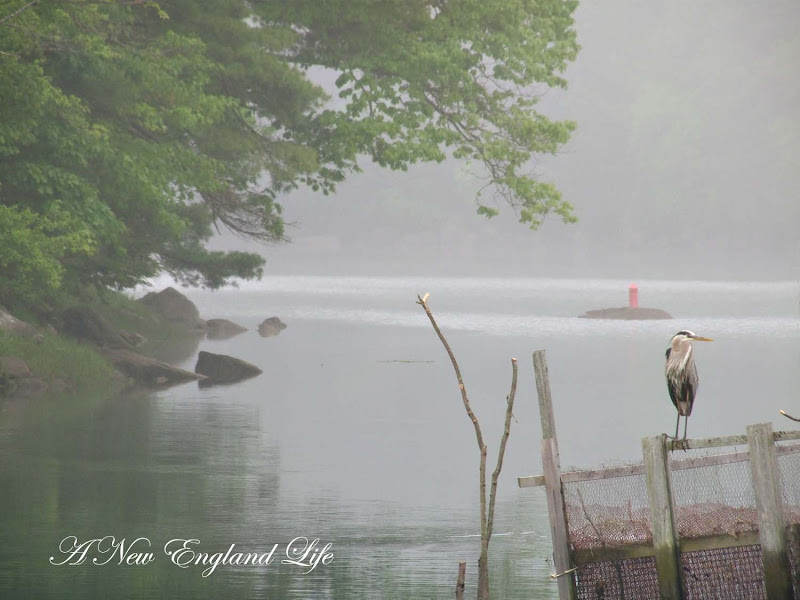 Love the herons in the foggy morning Sharon. Those look sort of like the Swan Geese I see in a duck pond near here. Have a great Memorial Day Sharon! Oh I love all of the bird shots!! The ducks crossing there really amused me. lol. All weekend we have been working on our gardens and our home, which is enjoyable to me. But today we'll be on the beach for at least a few hours. I can't wait! 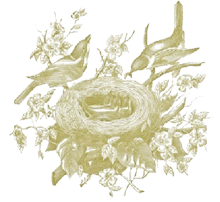 Wishing you and your daughter a pleasant Memorial Day at New Castle! Your photo's are beautiful as always Sharon. I love the herons and the geese pictures.Great shots. What's better than a parade of geese on Memorial Day? Love the roses on the river, too. That reflection of the boat is unbelievable! Have a great day with your daughter! The weekend weather has been great, but today, Monday? Wicked weather is passing through - heavy rain and wind. My trailer's rocking! Beautiful captures Sharon!I love the second photo with the GBH! Happy Memorial Day. These are gorgeous photos. Such a beautiful spot and I love the contrast between the bright colours & the dark. Love the geese. I wonder if they'd have let you get close enough to touch them? I'm also a huge fan of Herons. Looking forward to photos of your trip to New Castle. The roses are beautiful with the river in the background! But my favourite shot is the first one with the heron! 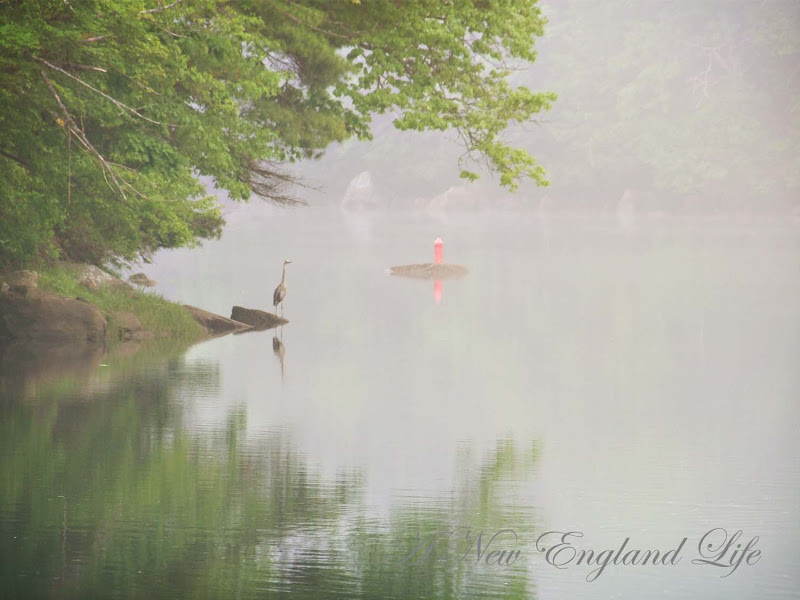 I love the soft focus from the fog, and it just looks like a painting!